A band which after six months existence and shortly after the making of their album „one“ was voted one of the best 15 bands of Austria by EMI Austria and Austrian radio Oe 3. 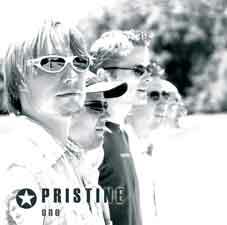 Guitar based Pop Rock stamped with an unmistakable voice make up the basic elements of PRISTINE. The most frequent comparisons made are from Bruce Springsteen, Bryan Adams, Scott Stapp ( Creed ) to Darius Rucker ( Hootie & the Blowfish ). PRISTINE play with a five man crew comprising of: Chris Schatz ( Voc, Guitar ), Gabor Ferencz ( Guitar ), Alex Drechsler ( Drums ), Andy Hofbauer ( Bass, Voc. ), Wiff Enzenhofer ( Keyb., Voc. ). The brand new album „one“ has 12 incredible tracks and should not be missing from any music fan’s collection. It is now finished and available for purchase from 18/10/05. From October ‘05 PRISTINE start a promotional tour right across Austria and you should not miss the opportunity to see the band playing live.